On April 2, 1849, twelve years after Michigan became a state, the Spring Lake Township Board was organized. At that time they voted to spend $50 to create a public library to be housed in the Township Clerk’s office which was in his home. After this initial outlay, $25 per year was allotted to the library for the purchase of new books. When the Spring Lake Village Hall was built in 1936, one room was set aside for the library, which served the community for twenty-eight years. In 1965 the library moved into the newly completed Spring Lake Township Hall building. At that time the collection had grown to 5,400 volumes. In 1970 the Spring Lake Township Board agreed to budget funds each year to be saved for building a new library in the future. Late in 1975 the property on the corner of Church and Exchange was purchased. A new building was constructed, and on June 18, 1977, the Warner Baird Library was dedicated. The realization of the dream of a new library building was made possible in part with the support of Warner and Julia Baird, residents of the community since 1919. 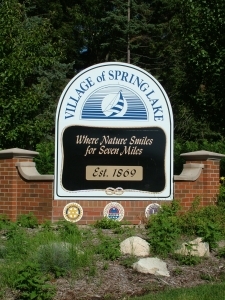 On May 2, 1994, the Village of Spring Lake and Spring Lake Township signed an agreement to create the Spring Lake District Library to serve both the Village and the Township. In 2001 residents of the district approved the building of a new library, and construction began in May 2002. 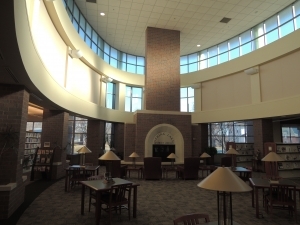 The Spring Lake District Library building was completed in April 2003 and dedicated on May 17, 2003.